Later this month I start my first term as Selectman in Bow. Below are a few thoughts about increased expenditures the taxpayers may be facing. The public safety building has been offered at a price $5,000,000, with approximate interest of $2,300,000, bearing in mind this does not include some site work, heating, ventilation, and air conditioning. •	Also noteworthy, the school board just increased the budget beyond the budget committee’s recommendations, including all day kindergarten, which is an $85 increase on a $250,000 assessed value. I find the $20,700,000 figure to be rather daunting for a town of Bow’s size, financially speaking. In regards to time frames, these projects could be implemented in just a handful of year resulting in overlapping bonding and a significant tax burden. Finally, we all had to take a deep breath when we read about the Bow power plant being sold, which currently pays 17% of the taxes in Bow. What will be the impact of the sale? Any predictions at this time are mere speculation at best, and therefore the financial impact over the years to come is unknown. Considering the numbers, I’m truly concerned about the likely tax ramifications of these sizable projects. How will Bow attract new families and businesses if the tax rate increases in a significant manner? Though Bow has seen the closing of our major taxpayer for 55 years, the PSNH Merrimack Station, as something that was eventually coming down the road, the end of the road is now upon us. At our recent town meeting, 576 voters stayed for a vote on whether to make a $5 million investment in a new safety building. We didn’t get a chance to vote on whether to spend about 10 percent of that amount to try to live a little bit longer with our existing facilities. The $5 million Warrant Article 3 missed a two-thirds majority by eight votes, and a motion was made for reconsideration. 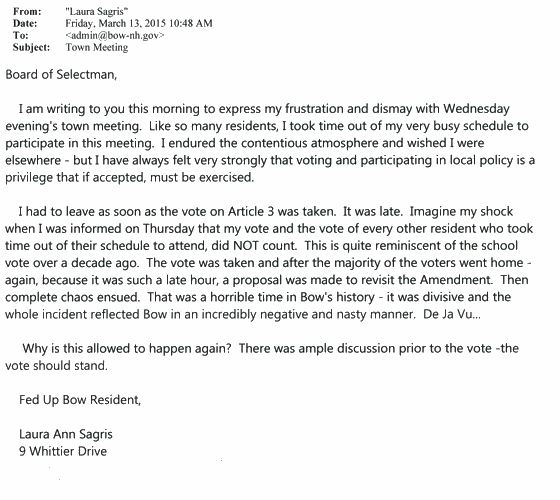 The reconsideration vote will be on Thursday, March 19, and I urge every voter in Bow to attend that meeting. There is a lot at stake for all of our households. As Chuck Douglas so eloquently put it at our meeting, we are the congress of Bow and it is how we vote that determines the direction of our town.